Daimler Insurance Americas' Anamika Singhal: Customers need one product that guarantees genuine parts. 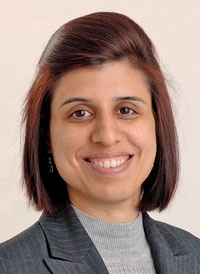 Anamika Singhal, 37, leads a team at Daimler Insurance Americas that in three years has introduced more than 25 branded insurance products for Mercedes, Smart and Sprinter dealers. She spoke with Special Correspondent Jim Henry. What makes the brand-name products so much better? The clear trend in the insurance industry, not just in the U.S., is that most of the repair is being routed to a third party, using aftermarket parts. ... You end up with someone working on the car that's really not certified. Ultimately, it could even be a safety consideration. It's of high strategic value to make sure customers have one product that guarantees genuine parts, as well as making sure all the work is routed to M-B dealers or certified service shops. We also differentiated the product by bringing in service to cater to our customers -- for instance, a concierge service and a 12-month guarantee on insurance premiums. Also, if there's an accident, a total loss within the first 12 months, the insurance covers full replacement for a new Mercedes. For wheel-and-tire and GAP, you have the same themes. We wanted to make sure the product is tailored to the M-B customer and in doing so offered replacement coverage, making sure the customer gets the most comprehensive coverage and OEM parts for replacement. That not only supplies F&I income; it also enhances back-end revenue when it comes to parts. Your wheel-and-tire policy replaces wheels outright. Replacement, when it comes to wheels, is important. For a wheel to be repaired, it could be so damaged that there could be safety issues. We want to stay away from anything where we're repairing a structurally damaged wheel. In 2008 we added an enhancement also covering cosmetic damage -- for instance, if you scrape your wheel against the curb and it doesn't take much to technically repair. Paintless dent repair and windshield coverage. That's often sold as all one package. You can buy them separately or bundle them together. The windshield coverage offers replacement-only coverage. You typically see repair work being done on windshields, but as you know, most of our cars have rain-sensing wipers. To go with non-OEM windshields, you may lose that functionality. On the S class, you may also have night vision embedded in the windshield. Another potential issue is leases; if you repair the windshield, it may be considered "wear and tear." We avoid all those potential issues. You also recently announced interior and exterior coverage. This one took the most due diligence because you are actually applying something to the vehicle. We wanted to make sure we were very, very comfortable. We worked with M-B USA engineers and all the way to Stuttgart for consent. This is the only product out there that is approved by M-B for interior and exterior protection. Our partner on this is DuPont. The fact that they are the supplier for the paint gives it added credibility. It's not some third-party company that's not been around too long. How is that different from Brand X? How the product is stored and handled. With competitors, they give the dealer these multigallon containers that can sit in the dealership for months or years. The chemicals over time degrade. We've seen examples when the chemical applied to the vehicle made the paint turn green. Our product comes in small containers. They're available for dealers on a consignment basis; they don't have to pay for it until they sell the policy. Have you finished rolling out the new products? Most recently we just started the pilot for First Class Lease Protection. It lets the customer take a lease without the worry of excess wear and tear. The way it typically works [with competing products] is at the end of the lease, there's an inspection. Then if there's excess wear and tear, the insurance company for that has to go through an inspection again, and then the customer has to wait for reimbursement. But the customer has to come up with the money out of pocket at the time. We have found that comes out of the money people put toward a down payment on a new lease. It can be days or weeks after reinspection by a third party for the customer to get reimbursed, and even then, a lot of times it's not the entire amount; there's a gap in terms of reimbursement. How is the new product better? It's essentially a waiver. The customer goes through the dealer inspection. Right there, as part of the lease end process, the customer gets a statement how much it is -- only in this case, it's a zero bill. It's much, much easier for the dealer to make that value proposition. The customer doesn't have to come up with $1,000 or $2,000. They can use that money to buy more vehicle or use it toward a down payment. It's coverage of up to $7,500. That's the other issue with third-party coverage; it's typically in the $2,000 to $5,000 range.